On Friday I had a Terrible, Horrible, No Good, Very Bad Day. I didn’t get to run, I had a cold, I had one of those bizarre sleep-related injuries where you wake up and can’t turn your head and we’d run out of coffee. And I had really bad hair. So when the day finally ended I made myself a refreshing gin and tonic and turned to baking. I wanted to make something completely impractical, with no pretense of moderation. 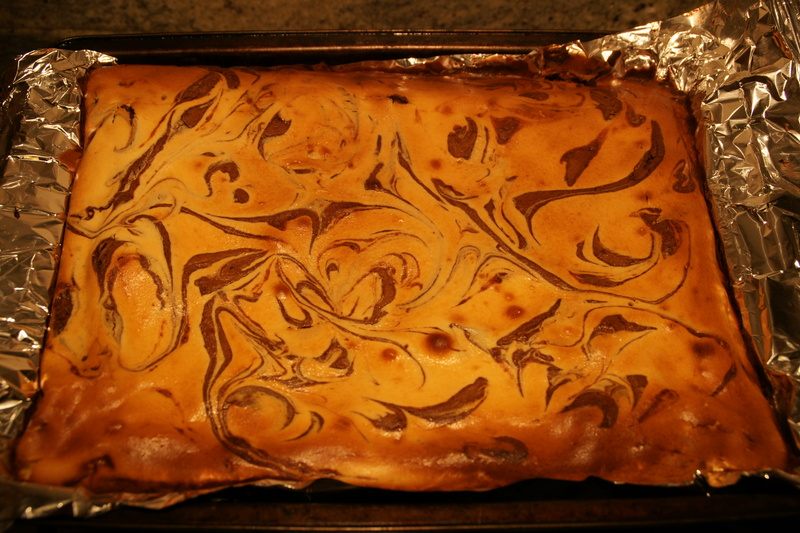 So I made marbled mocha brownies from Belinda Jeffery’s book Mix & Bake. I’d been meaning to make this recipe for a while and I’m glad I finally got around to it. It was a bit more involved than other brownies I have made (although I don’t claim to be an expert) but the results were worth the effort. 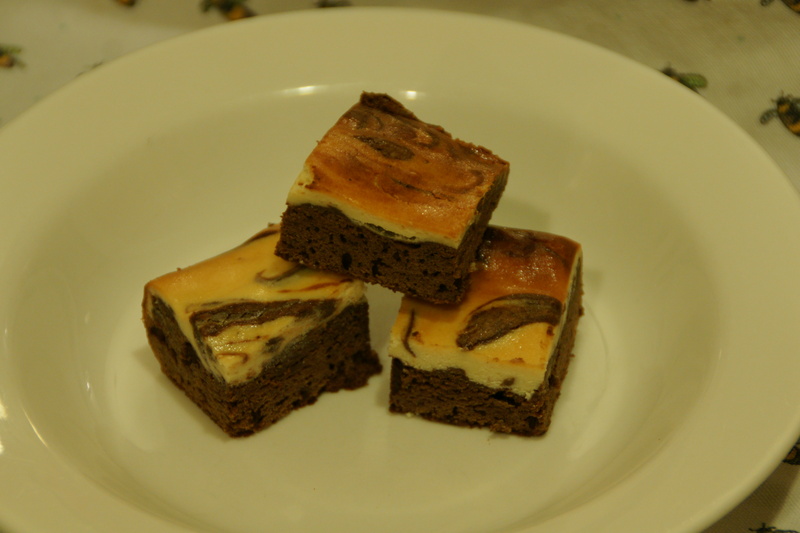 It also seems to freeze quite well.The brownies have two distinct layers – one packed with dark chocolate, strong coffee, ground coffee and butter, and the second made with cream cheese, sour cream and a touch of coffee. The cream cheese layer gets dolloped on top of the dark layer, and then the two get swirled together. The recipe said to bake the brownies for 35 to 40 minutes, or until the edges are golden brown. As you can see, I overbaked mine. I was worried they would be dry, but they seemed ok. I guess that’s one of the advantages of huge amounts of butter, eggs and chocolate. But it’s still pretty, right? Unfortunately I was in a rush when I was cutting up the slab and forgot to photograph it. Can you believe it? It’s like actually eating it was more important! Luckily I had saved a few bits for a friend, so I took photos of them. Unluckily for me, they were end bits so they are not as pretty as the other bits. And unfortunately for my friend, the husband has now eaten them. Guess I’d better make another batch! And the bad day? Cured by the magical combined powers of baking and gin. Baking and gin sounds like a new cake waiting to happen..